The hydration reactor made of 904L stainless steel clad steel plates. 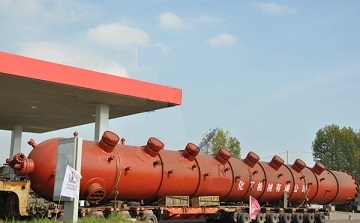 Hebei Metals Industrial Limited has engaged in the supply of chemical pressure vessels for an isopropanol project in Egypt. The hydration reactor is made of 904L stainless steel clad steel plates: base metal – plates of ASME SA-516 Gr.65 with 94 mm thickness, cladding metal – plates of stainless steel 904L (ASME SA-240 Gr. N08904) with 6 mm thickness. The cladding plates are manufactured in accordance with ASME SB-264.